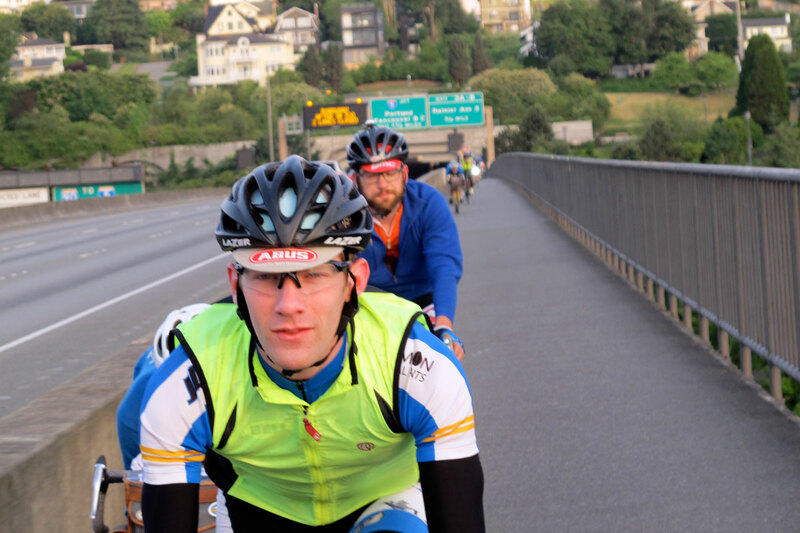 Last weekend was the Seattle International Randonneurs 600 km brevet. Not only was it the last brevet we needed to qualify for Paris-Brest-Paris, but we also had a goal of finishing it in R60 time: 24 hours for 600 km. As usual, I rode my bike to the start. 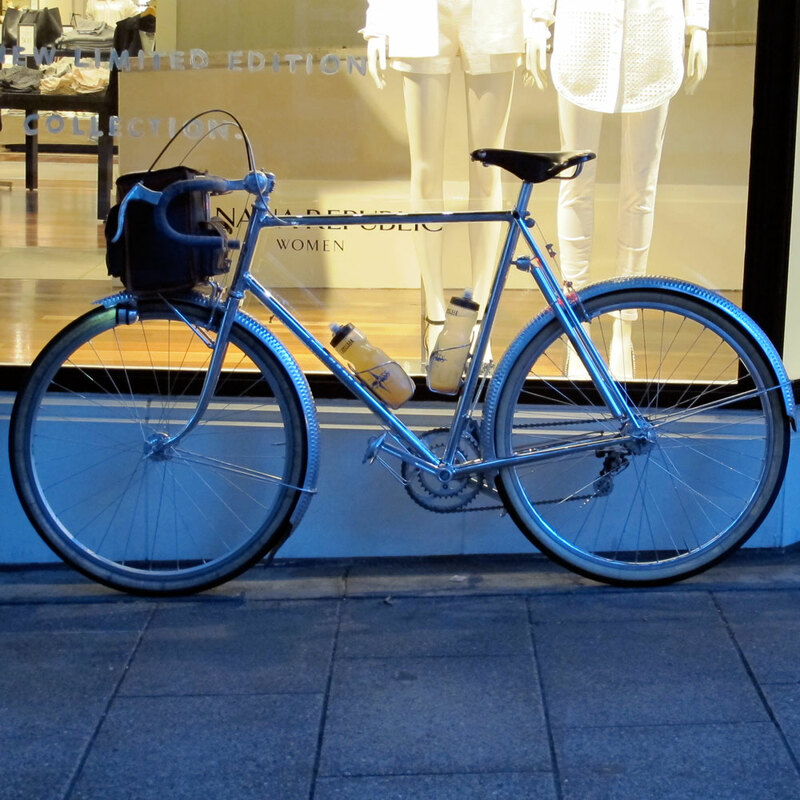 It was fun to ride through a deserted downtown Seattle so early on Saturday morning. It’s a moment full of anticipation, of looking forward to an extraordinary day on the bike. The ride started at 6 a.m, and almost immediately stopped again. A long freight train was blocking a level crossing. Rather than wait (these trains can take 15 minutes or longer to get moving), some of us decided to head a few blocks to the North, where there is an overpass across the tracks. The morning was overcast, but the views were no less spectacular for it. 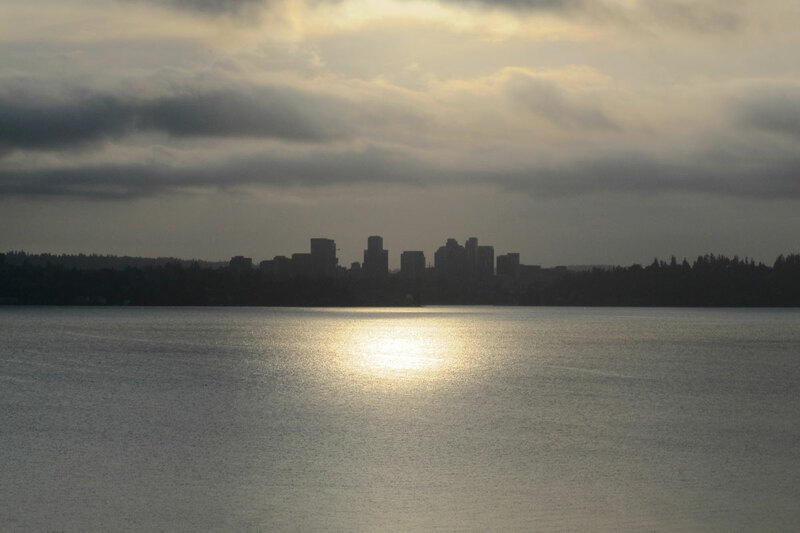 The sun was peeking out from behind the clouds as we looked toward Bellevue. It was surprising to me how unstable my bike was as I took the photo. “Look where you want to go,” I wrote in one of Bicycle Quarterly‘s “Skill” columns. This is even more true when riding no-hands. 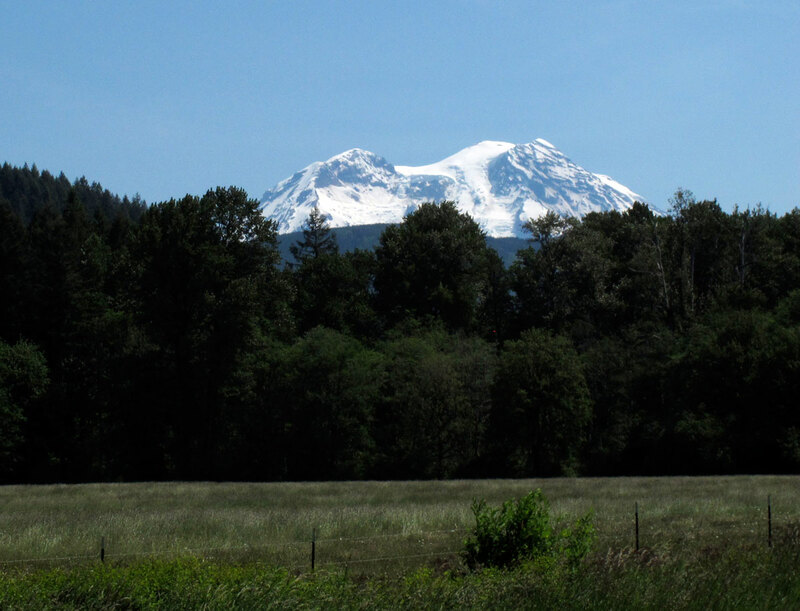 Our group smoothly climbed the Cascade foothills as we made our way south toward Mount Rainier. 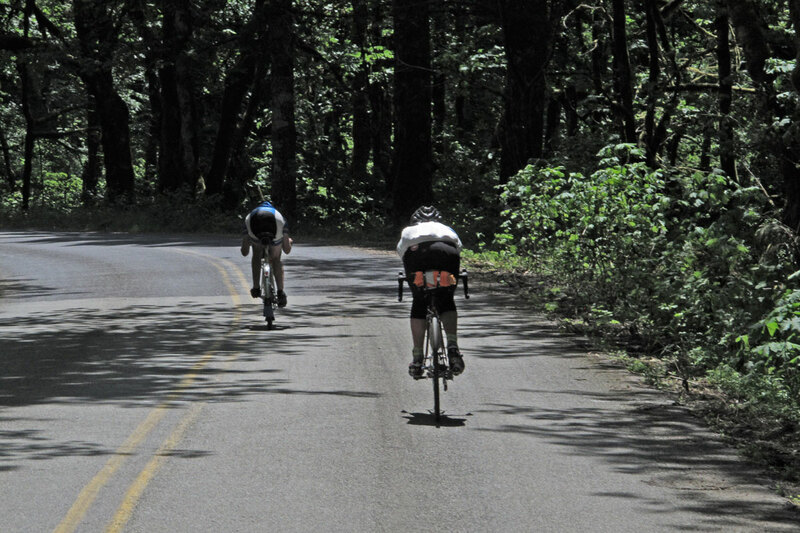 The reason you see so few photos of riders pedaling is simple: It’s hard to take photos while working hard. It’s only when coasting that I can easily reach into my handlebar bag and pull out the camera. A few hours later, and we were approaching Mount Rainier. It looks so different every time I see it, depending on my viewpoint and the season. Right now, the volcanic cone still is covered with snow. It’s a long climb up the Nisqually River valley, but the gradient is almost imperceptible. So it’s easy to work too hard here trying to keep the speed up. The secret is to relax and go a little slower, rather than ride yourself into the ground. Skate Creek Road always is a favorite, and on this glorious day, it was no exception. 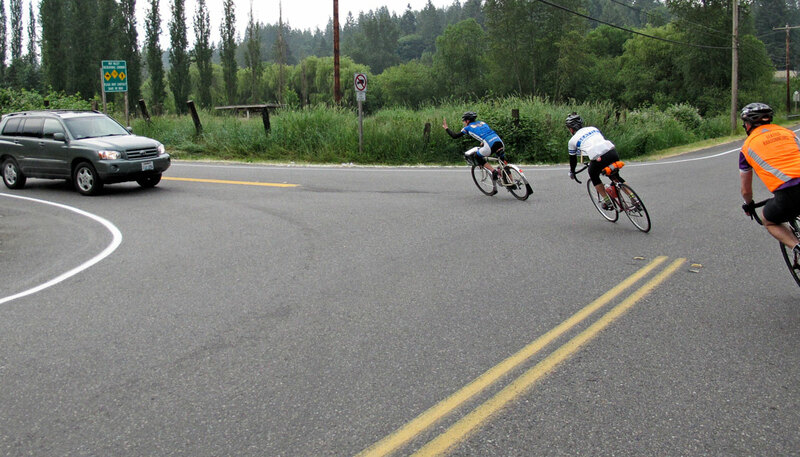 We played during the descents, here Steve is in the aero tuck, rapidly catching up to Wade who hasn’t tucked his arms and is visibly less aerodynamic. As expected, we encountered fierce headwinds in the Cowlitz River valley as the warm air from the lowland rose up the slopes of the Cascades. 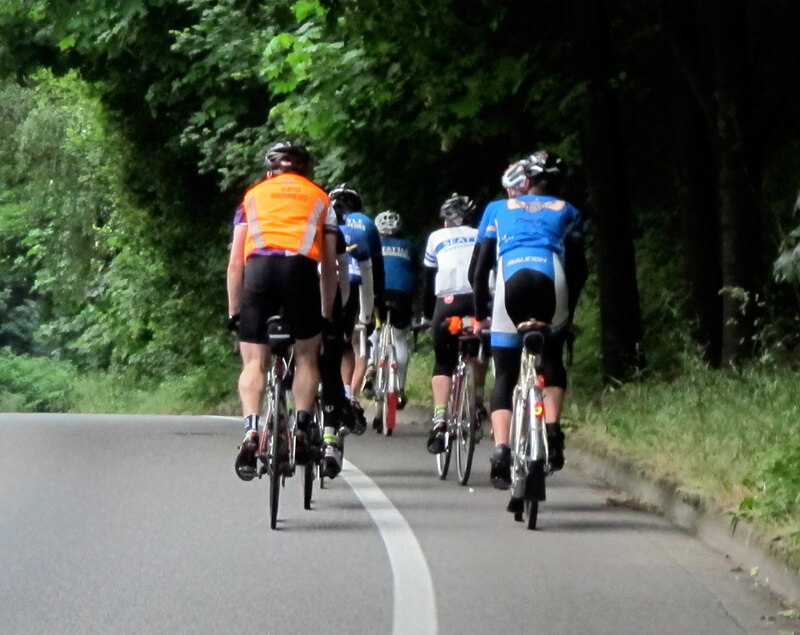 Fortunately, our group of 7 was large enough to form an efficient rotating paceline. The wind was slightly from the left, and you can see that only Steve (first on the right) is bent low over the handlebars. He is just getting to the front, so he’ll be facing the wind head-on. But he has momentum from drafting the rider to his left, and he is about to pull off himself and slow down. The riders on the left are facing the wind with less protection, but they are riding slower than the protected riders on the right. This means that no rider ever faces the wind for more than a few seconds. We went about 2 mph (3.2 km/h) faster than if we had just ridden in a standard double paceline, and expended less energy. And it was fun. We had asked the organizer for permission to use backroads that took us off the “official” course that ran along the highway. We were assured there were no secret controls on these stretches of relief from the monotony and traffic of the highway. As an added bonus, the wind was much less strong on the sides of the valley. The pace started to take its toll, and several riders elected to make a longer stop in Morton, so our group now was down to four. Here we enjoy the golden evening light on the way to the “overnight” control in Elma. The rough pavement seemed to take a toll on James on his racing bike, and he decided to stop and sleep, while Steve, Wade and I continued. Steve, Wade and I have ridden a lot together. We know each other’s styles, so we can ride through the night without having to worry about touching wheels and crashing. Each of them is very smooth and predictable. The photo at the top of the post is typical: Coasting downhill, playing with each others’ drafts, so we are rotating even as we are in the aero tuck. Both also are great conversationalists, so the time never gets long with them! At midnight, we reached the control at the edge of the Tahuya Hills, where we enjoyed the hospitality of the volunteers, who made us hot soup. It was fun to sit around a campfire for a few minutes and relax, before tackling the pièce de résistance of this ride. The Tahyua Hills are a magical landscape. Illuminated by the moon, the hills and valleys looked even more mystical than usual. These hills are steep and relentless, and depending on your form and state of fatigue, they can be daunting or a lot of fun. For us, it was the latter. The rises and falls of the road have a good rhythm, and we climbed them smoothly. 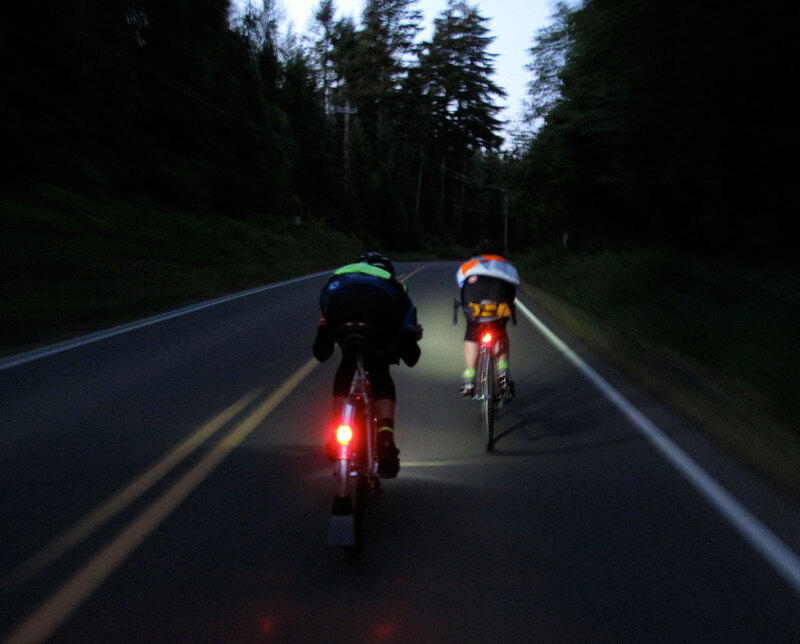 Our headlight beams pierced the night as we speared down the descents, trying to discern where the road was leading. When we reached the highway again with its punishing climb, we decided to walk. This allowed us to reach the long false flat on the approach to Seabeck with fresh legs. Instead of trying to recover on that long uphill, we started it with relatively fresh legs. Walking probably saved us time in the end. We rested for three minutes in Seabeck, laying down on a picnic table. Then we headed up Anderson Hill Road. This road is the most punishing, and I don’t know anybody who enjoys it. The first part is steep. Then follows a super-fast downhill and an even steeper uphill. On top of that comes an even steeper hill. We walked the first hill, then coasted the downhill to gain speed that carried us up the next hill, before walking the third. From there, it was relatively smooth sailing. Knowing that the finish was close made us forget the little aches and pains that are an inevitable part of such a long ride. Twilight announced the new day as we approached Port Gamble, and more backroads took us back to Bainbridge Island and the finish. We completed the ride in 23:35 hours and now are on our way to PBP! It was a hard ride, I cannot deny that, but the teamwork with friends is memorable and makes it special. I love seeing the mix of bicycles. Carbon, custom, and a vintage TREK! I have so much confidence in their bikes that I’d suggest some testing. Sure there are WAAAY too many vintage bikes to sift through to make comparisons, but certainly there is a bike or two that was built in mass and still readily available that has something to teach to BQ and its readers. It wouldn’t necessarily be a 650b conversion bike (another idea), but it could lead to what makers knew 20-40 years ago about steel road bikes. TREK and others had high end hand made (impossible to find) bikes that would be show worthy, but even the middle and lower end bikes are worthy of our attention and admiration. A BQ article would prob make eBay sales and prices rise too, so maybe I should delete this post… Nah. I’d rather hear what you’d say about a TREK-like bike with room for 30mm tires, decent-high quality frame, narrow cranks, and elegance for the price of a double crank… or a touch more. Congrats on the ride and nice write up. While you mention walking and resting near Belfair, could that be Seabeck instead? You are right – I’ll correct the mistake. It looks like professional racers have transitioned away from the traditional aero tuck to squatting down over the top tube. Have you experimented with this technique? I’m guessing it would be most effective with a sloping top tube. We experimented with different techniques. Unless you have a very low top tube, the traditional aero tuck is most efficient. It also provides the best control. I just don’t like to do downhills in the aertuck on winding roads. You never know what’s round the next bend. May be nitpicking or it may save someone a lot of grief, but no one on the road “has right of way”. One must “yield right of way” to another party, but that party doesn’t “have right of way”. The distinction causes the endangered party to be more certain that the other party will act safely. Thanks for the inspiring ride report. Riding this as with a fast group was a very good learning experience for me. The two big learnings for me were 1) I need to run tires wider than 23mm , and 2) it’s important to know when to go slow. There were sections of the route where most of the road was rough chipseal, but the shoulders were smooth pavement. Riding on the smooth pavement gave me an extra 2 to 3 kmh for the same effort, so if the shock absorption of wider tires gives a similar effect, it would make sense to switch over. But the most significant problem I had was with the Garmin 810. Everything was fine until Tahuya, and I started down the little spur on North Shore Rd just past the right turn for the climb when the Garmin started beeping and telling me to make a U-turn. I quickly did this and labored up the steep climb, looking for the control at km 377. Not having seen anything, I stopped at the fire hall where there was light, and checked the route sheet. It said not to turn right, but to head straight into Tahuya. So I rode back down the hill, into Tahuya where I spent the next ten minutes riding back and forth looking for the control, Once back on the road, the Garmin misdirected me onto all sorts of gravel roads thru the Tahuya Hills, what a mess! Jan, when you “rested 3 minutes in Belfair,” do you not mean Seabeck? Belfair is the turn at the end of the long inlet we had to ride around to get from Potlatch to Tahuya! Yes, Seabeck. My mistake (since corrected). Sorry to hear about your Garmin troubles, Luis. Unfortunately some sort of glitch or misdirection is practically guaranteed on longer routes. I think it is pretty clear Garmin does not test their products over randonee distances, nor do they ensure that the devices navigate the same as the desktop software. My Oregon often routes differently in the field than BaseCamp on my computer does. I have learned to always display the breadcrumb track. When the Garmin’s directions diverge from the track, I follow the track. In the Tahuya hills your Garmin was probably working correctly, given the particular routing settings you used. When I prepared my gps file Basecamp tried to route on lots of smaller roads through that area. I had to make a lot of manual adjustments to the route. Of course when you are using a tcx file you expect to be able to load the file and go…. If I could still read cue sheets at night I would not have a gps! On the Edge 705 you can turn off “auto route recompute”. Recompute is a very bad feature in brevets, because it sometimes recomputes the entire route to the next goal, which will have nothing to do with the original course. Great ride report. Thank you for sharing. I get the feeling that you are trying to debunk some myths that you have to be a super human cyclist to ride long distances. I appreciate how you focused on your energy saving techniques, enjoying the ride with friends, and the places you visited. Well written as always. Great story. Have just tried to retrace some of it on google maps. I really appreciate these stories. Even though with the speed I drive 24 hours is far from my ability. And its not the coasting or walking that is the problem. Probably more the efficiency of the pedalling. I never ride through the night after a whole day in the saddle, as I fall a sleep. And it is scary to wake up as Your front wheel leaves the road. 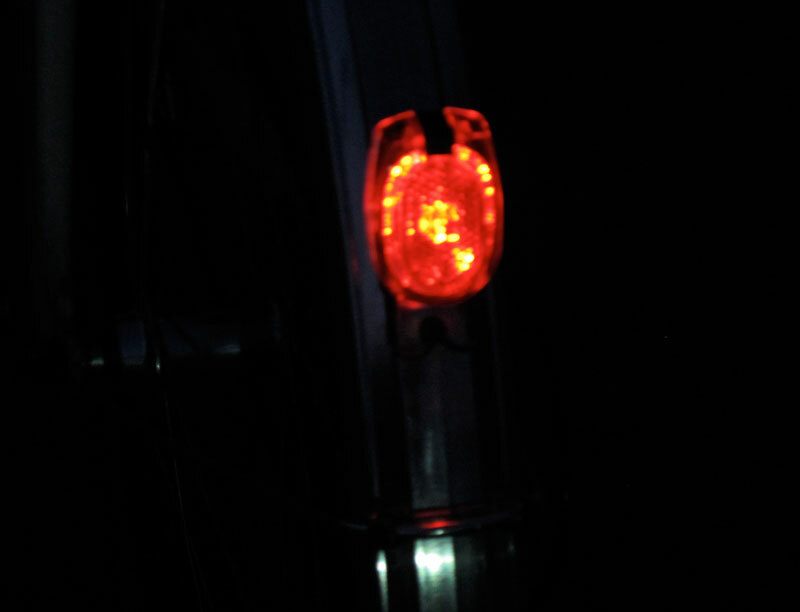 Apart from that nightriding has a unique beaty to it, and the intensity of the sounds seem so much stronger. Passing through woods and hearing the Nightingale is unforgetable. Sidenote on the GPS problems of Luis, and I do not use one my self. Most riders I know ride with the nose of the saddle up a bit, so they don’t slide forward. This reduces the pressure on hands, arms and shoulders, which is where I usually feel discomfort first. No “pelvic” discomfort in any riding position, but, of course, “your mileage may vary”. Jan, I’d like to see more of your thoughts on saddle positioning, relative to healthy blood flow, knowing it’s a very personal subject. I too am perplexed by many leather saddles titled upward. The logic makes sense, but aren’t you trading hand or shoulder pressure for perineum pressure? We all can feel our hands hurt, but not always when vital pudendal nerves or vessels are compressed, since this can occur before one feels any numbness. I think that saddle position is very personal, and generalized guidelines aren’t of much use. I’ve ridden my saddles tilted slightly upward like this for more than 25 years and more than 100,000 miles with no problems. It may depend on how you sit on the saddle. Most riders I know don’t have a “flat” back, but arch theirs a bit, so that their pelvis is more upright than the low handlebar position implies. Wonderful story that is motivating to me although I am very jealous that you have like minded, fellow Randonneurs to go for 24 hours as a test/challenge. I have a similar time objective on an upcoming 600K that unfortunately will be solo. Normally, I would ride slower with a group and then sleep. I want to test myself. A Brevet is a test, right? Few have done 600K under 24 hours…..to enjoy the test with others….. a big Congrats to all of you. It would have been difficult to do without the others. Not only did we share the pulls, but it’s also more fun to ride with others. It surprises me that RUSA allows drafting, as they are proponents of self reliance. I guess it’s the comeraidery factor. On the other hand, they won’t allow a non-member friend to ride along on a permanent with you. 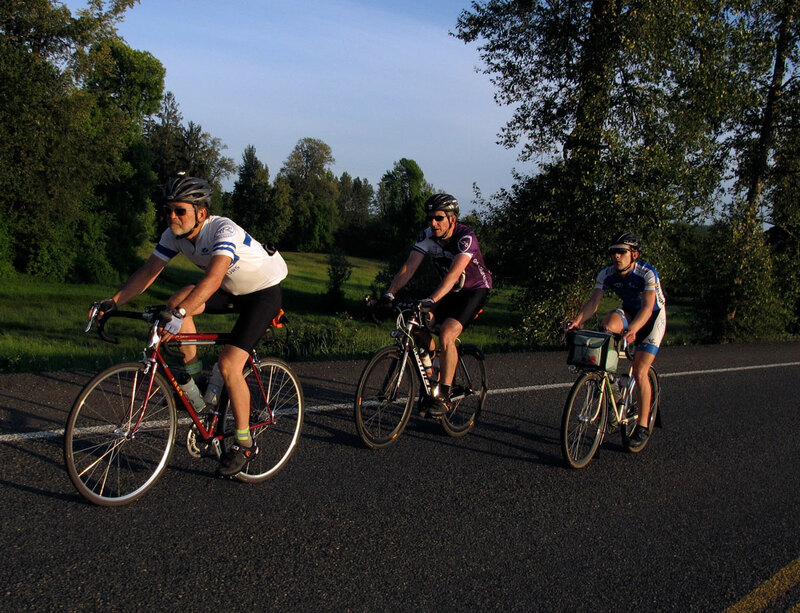 Randonneuring always has been a team sport, so working together is definitely OK and even encouraged. You are right, however, that outside help is not permitted. Otherwise, you could, in theory, have a bunch of pacers posted along the course, like they did in the first Paris-Brest-Paris races. As always an excellent, motivating article. After reading many of your racing articles, I am curious as to what pedals and shoes you prefer since you walk at strategic points. I believe Jan uses Sidi MTB shoes and Shimano A-600 (spd) pedals (it’s nighttime in Seattle so forgive my answering!). Shoes are perhaps a bit like helmets: stick with the brand that works for you. I use the same combo, but will be switching to VP Bebop pedals, as my knees are used to free-float (Speedplay), and I don’t like the length of the Shimano axle (greater tread, or Q factor). Being able to walk is great not only for steep hills, but also controls. Walking stretches your legs in ways that hobbling with “road” shoes does not. Wow! What a great ride and ride report! As a person who has yet to be able to ride like this, you give me inspiration, but also I see things from my perspective as well as yours. I really liked all the “action” photos in this essay. I can’t imagine how you got the action photo of your compatriot and the Ferrari behind you, except that you used your skills technique of moving off the saddle and balancing on your thigh while you turn around. I know you’ve done it before, but I wonder if you could update us on your photo equipment as of today. Surely you didn’t take all these action shots with just a smartphone? Touching the screen with your finger would lead to too much camera shake. I assume you have some lightweight DSLR with a shutter button, that you can operate one-handed. Do use a hand strap to securely hold the camera? Or some kind of chest monopod to keep the camera steady? I assume you have an image stabilized lens to get as good focus as you did. Would you mind telling us the specs of the lens you were using, the f/ number, mm, is it a zoom? Photos were taken with a Canon G12 that I carry on most of my rides. Image quality is good, and the camera is light and small enough that it won’t affect the performance on a challenging ride like this. The shots are free-hand – a few were shaky, but many worked out OK. Turning back isn’t so hard once you know to let go of the bars and rotate your torso (as you mentioned, it was described in a “Skills” column in BQ). Photoshop work was kept to a minimum, just a little lightening of shadows and adjusting tone and contrast. For Bicycle Quarterly, the little camera is a bit marginal, and of course, our photo people are wizards who make the images so much more brilliant, without making them look artificial. The DSLR is great, and I can manage it fine on the bike, but it’s cumbersome to carry and takes up most of the handlebar bag, so I don’t usually carry it on rides where performance is paramount. And BTW, congrats on your great time and qualifying for the BPB! Best wishes to you! Well done … strong head strong body strong spirit! You’ve probably written about this before … but can you please make a list of the things that you carry for a such a ride? (specifically what type of food and how much … and if it was supplemented by food foraged en route). On this ride, I carried and drank 8 bottles of Ensure Plus (a meal replacement drink), a few Clif Bars (hard to eat when it’s hot) and three bars of chocolate. I bought a few ice cream bars along the route, as well as drink (water, apple juice, Coca Cola). I ate a piece of lasagna at the “overnight” control (small piece, hard to digest) and a little bit of soup at the midnight control. I also ate one Clif Bloc electrolyte replacement thingy (I’d have eaten more if I had them, but I was too busy to shop before the ride), and I carried a few gel packs in case I bonked, which fortunately didn’t happen. Thanks for the ideas. I’ve yet to try Ensure, but I’ve heard that recommendation from others. One of my favorite things on a long ride is small boiled potatoes rolled in sea salt and parmesan cheese. I then package them separately in foil for convenience. Friends call them my ride spuds and usually put in requests for them a few days before a ride.They are a nice change from food in bar form which gets old really quick for me. For a more detailed list of all the things I carry in my handlebar bag (with a photo of the contents laid out), see the article about the Raid Pyrénéen in Bicycle Quarterly 46 (Vol. 12, No. 4). Thanks Jan … and thanks for the ideas. I find that I feel best (or at least ‘least crap’) with semi normal food like jam sandwiches … but I haven’t experimented much. I wonder how the Randonneurs in France back in the pre-40’s era scavenged for liquids to drink on their long and remote mountainous brevets. No convenience stores back then along the way and only 2 or 3 bottles on board. Wonder how they managed their electrolytes, salt, and potassium back then. Any known history on that?